Life gets in the way. I’m sitting now in my office trying to write my first Expressive Clay Art blog since December 2016, feeling embarrassed that I’ve let it go so long. That’s the thing about blogging; it needs to be done regularly for people to want to follow your posts. And I’ve dedicated little time to actually making pottery lately, which is unfortunate as it is my favorite thing to do. The truth is that doing what you love often takes a backseat to “life”. This year was a challenging one for my family and time in my pottery studio was limited. I wish I made more of an effort to carve out time though as doing so might have provided some much needed respite. Creating art, for me, is undeniably conducive to happiness. Pablo Picasso once said, “Art washes away from the soul the dust of everyday life”. I agree wholeheartedly. My resolution for 2018 is to dedicate a chunk of time for work in my studio each week. What is life worth living for anyway? I believe that spending as much time as possible doing what you love is a big part of it. This activity could be gardening, reading, hanging out with family…whatever it is that brings you joy should have a place in your life. You may not feel you have time, but life is short. Make time. Staying focused and creative is a wonderful outlet for your emotions. Are you one of these people (like so many of us) that gave up your art because you “don’t have time”? Today is my first post on my new blog. I hope to inspire others the way I was inspired by so many along the way. For years I’ve taken pottery classes and frequented outside workshops and studios, had some fabulous instructors, and enjoyed the camaraderie and learning opportunities that developed as a result. As I could not seem to ever find enough time to do my clay work, I recently decided to build a garage studio to allow me to spend more time doing what I love most. So this is my studio. 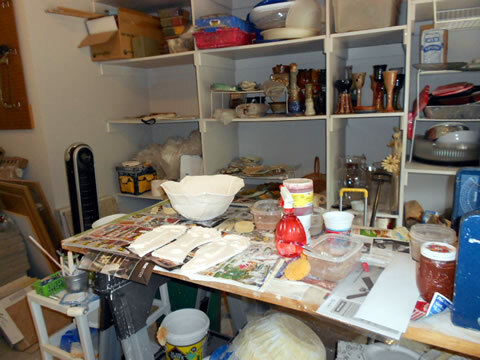 Nothing fancy, fairly small as far as studios go, and happily cluttered with tools, glazes, oxides, stamps, the kiln, and projects in all phases of the process. Each high-fired piece takes about three weeks to make from beginning to end. (More on the process in a future post). I have everything I need. A large worktable, a slab roller, a small kiln, and lots and lots of shelves. Yesterday I installed a powerful overhead fan because the garage does not have air conditioning and Texas summers are brutal – and with the kiln running at 2200 degrees, the studio was pretty toasty. I like to work with the garage door open for the natural lighting and fresh air so I am determined to avoid air conditioning as long as possible. I opened an Etsy shop in March (https://www.etsy.com/shop/ExpressiveClayArt) and admittedly am a little overwhelmed by the response. I’m well aware that this is a wonderful problem to have, and I love that people are finding me and liking my work enough to purchase online, but I am in need of a system to work more efficiently. Making the art is only half the story; no business is successful without a great deal of creative marketing and a good business model. I will share what I learn as I go along. I hope to provide helpful information that will apply to start-up businesses of all kinds. Stay tuned! I was lucky enough to be part of a wonderful group of ladies organizing a bridal shower for a friend’s child recently. We all pitched in to create a light summer menu with gazpacho, 3 fancy salads, and a variety of desserts. One of the women made a unique and beautiful cake made from cupcakes in the shape of a bridal dress, complete with swirly white icing and pearls at the neckline. To accompany our summery theme, the cheerful centerpieces (above) were made from fruit and placed on the tables for guests to help themselves. A number of people asked how to make the centerpieces, which is why I decided to post the instructions. Wash the fruits as needed. Prepare the fruit. For example, cut pineapple and canteloupe slices about 1/4 inch thick. Cut the heads off the strawberries. Create flowers or other shapes using the cookie cutters. Pineapple, canteloupe and kiwi are generally the easiest fruits with which to work with the cookie cutters. Dip the strawberries in melted chocolate if you want. A pineapple flower half dipped looks and tastes great too! Thread a raisin onto each skewer, then add fruit (the raisin is to prevent the fruit from sliding down the skewer). Be creative with your combinations – there is no wrong way to do it! These centerpieces are easy unless the fruit is too ripe, which is a problem I had with mine. The fruit did not want to hold it’s flower shape once cut, and so I added more skewers with grapes, blueberries and strawberries. Do you have a favorite edible centerpiece? There is no way to make sense of the attack in NICE yesterday. I cannot stop thinking about the families visiting together on the beach, watching fireworks, enjoying the Bastille holiday. The horrific attack left huge numbers of people injured or dead. The most recent count I heard was 83 dead, more than 100 injured. Two of the victims were from Austin- a father and son – on holiday with their family, which brings it even closer to home. The Copeland’s are a beautiful family forever changed. They flew to France as a family of five, and will go home as a family of three. Carnage on the road…what a crazy world we live in. Add this attack to the recent tragedies in Minnesota, Louisiana and then Dallas – when and how will these awful events end?? My heart goes out to all affected. I happened to be in the West End one week prior to the Dallas shootings sharing a carefree meal with some old friends. We could easily have been there on that very night. The violence and devastation feel very personal…it is not just happening “somewhere else”. Random attacks are escalating at an alarming rate, and often seem calculated and carefully executed. While none of us is capable of changing the world, I firmly believe we can all work together to make small changes in our little part of it. I am committing to starting today to work toward improving my small piece of the world. Creative people need to create. I’ve unfortunately spent very little time in my clay studio over the past few months. Working with ceramics provides a creative outlet for me unlike any other activity, and I feel the need to get back to it SOON! I really miss working with clay. We are building a vacation home in Texas Hill Country overlooking a lake, which is the primary reason I do not have time to play in my studio right now. This endeavor, as wonderful as it will be when complete, requires a great deal more time, effort and research than I anticipated. I have no experience building a house, yet somehow felt because I am “creative” I would simply figure it out. Ha! Designing a house from scratch requires a whole lot more than “a good eye”. We are working with a builder, but because I want the house to be unique and interesting in addition to beautiful and functional, I am quite involved in the process. View from the screened in porch. Our builder is very good at evaluating my less than conventional ideas and letting us know if he can realistically incorporate my thoughts into the house within our budget. My favorite detail so far is the addition of 2 five foot wide windows that replace most of what would otherwise be the backsplash located between the kitchen cabinets and countertops on either side of the stove. As a result, the entire kitchen is flooded with light for most of the day which makes me incredibly happy. The house, when complete, will be handicapped accessible for the most part. We intend to rent it part of the time, and this population is one that sometimes struggles to find workable vacation destinations. It is not completely ADA compliant, however, the house is one level with no steps outside or in, doorways and hallways are wide to accommodate a wheelchair, the master bathroom contains a 7 foot roll-in shower, and the list goes on. This is not a vacation home a person with a disability would likely rent alone; our intent is to provide a comfortable vacation destination for a family that includes a child or parent needing accommodations. I am particularly sensitive to this issue as I have a parent who uses a wheelchair. Unfortunately, introducing accessibility into a home while maintaining its interesting, unique and beautiful appeal can be a challenge, but one I am diligently working to overcome. I will share pictures of the progress once we are further along. Though I am looking forward to the completion of the house and having my life back, I am enjoying the process. Building a house allows me to be creative in a very different way than I am accustomed. Wet clay is a forgiving medium, much like icing on a cake. If I don’t like the way a piece is developing, I smooth out the clay and start again. With a new home build, changes are expensive and not always easy, which means I may have to live with a mistake for a long time. The process is therefore stress-inducing as opposed to completely enjoyable time. The good news is that in the end I will have still have created a “beautiful thing”. In the words of Leo Burnett, the brilliant advertising executive who created campaigns like the Jolly Green Giant, the Pillsbury Doughboy and Morris the Cat, “Curiosity about life in all of its aspects, I think, is still the secret of great creative people”. Life provides ample opportunity to exercise creativity. What do you do when you don’t have time to be creative in your usual way? Check out my Etsy store if you have a chance – approximately 60 pieces for sale! Hello and welcome to the What Your Taste In Art Says About You test. A university study has determined through it’s experimentations that a person’s personality has a lot to do with the style of paintings they prefer. So for this test you will be exposed to six different styles of painting. There are 3 paintings on each page. Each painting is done in a different style. You will be asked to chose the style that most suits your visual appeal. At the end of the test you will find out what style you most preferred and what it says about you. Remember there are no right or wrong answers, just a matter of what you think is tasteful or at the very least suits your sense of taste and style. Please, take your time and enjoy the art. Art is meant to be appreciated. Looking for unique gifts is so frustrating! As a creative person, I look for artistic and unusual items for the special people in my life. Often I give my own work, but at this point everyone close to me already has a lot of my pottery. Below are five of my favorite interesting and creative gifts I came across this December. Beautiful pet gates with on trend designs to coordinate with your home! Great gift for those who both love their pets and their homes! This customized 18” regulation size Dart Board is made of quality cork & finished with a metal frame, wire numbering & inner grid. Full color is printed directly on the Dart Board. Comes with two sets of darts and is the perfect gift for his man cave! For the Book Lover – A scarf so she can bundle up with Jane Eyre, Wuthering heights, Alice in wonderland or another favorite classic! Perfect for your friends who love to read! Fun, adorable, inexpensive and surprisingly functional! Easily identify which phone charger belongs to whom! Classic Pocket Adjustable Belts – Carry a few essentials around your waist without looking bulky. This soft spandex colorful knit belt has two interior compartments for cash, cards, and even a cell phone. Adjusts quickly for a customized, snug fit that stays in place—even during a workout. Do you have other creative ideas for gifts you can share? Would love to hear from you! “Patience is a virtue” is one of those 14th century phrases many of us heard from our parents growing up. As an adult, I’ve used it with my children. I agree patience is a virtue, but wish that becoming a patient person did not require so much concentrated effort. It’s all about working on one’s attitude while waiting, allowing the process to take place in due time without becoming frustrated. In a fast-paced world, I make slow art. Creating pottery is a practice in patience. Each clay piece is first formed by hand, then wrapped in plastic until dry enough to go into the kiln for the first firing. Once out of the kiln, the piece is glazed, then fired again at a higher temperature. The process for each piece takes approximately three weeks from start to finish, and the potential for loss is great at each stage. Remaining calm both inside and out throughout the course of the work is essential for the process to be bearable. The process cannot and should not be rushed to achieve my best work. I work daily on patience which requires serious discipline and effort. Situations frequently arise that require self-control. I’m not referring just to my artwork, but also to normal everyday life such as standing in line at the supermarket, fighting traffic, or waiting for a loquacious friend to finish a thought. Learning to be patient is exhausting. It takes endurance and it takes training our minds to be satisfied with each step of the process. Waiting and delays allow us unplanned time that can lead to growth and productivity. The truth is that we may as well relax and enjoy the downtime; we can choose to be angry and impatient while forced to wait, or we can learn to adopt a more positive attitude toward a situation that is not within our control. How do you practice patience? And how does patience impact your life and your art? Your studio is a mess. 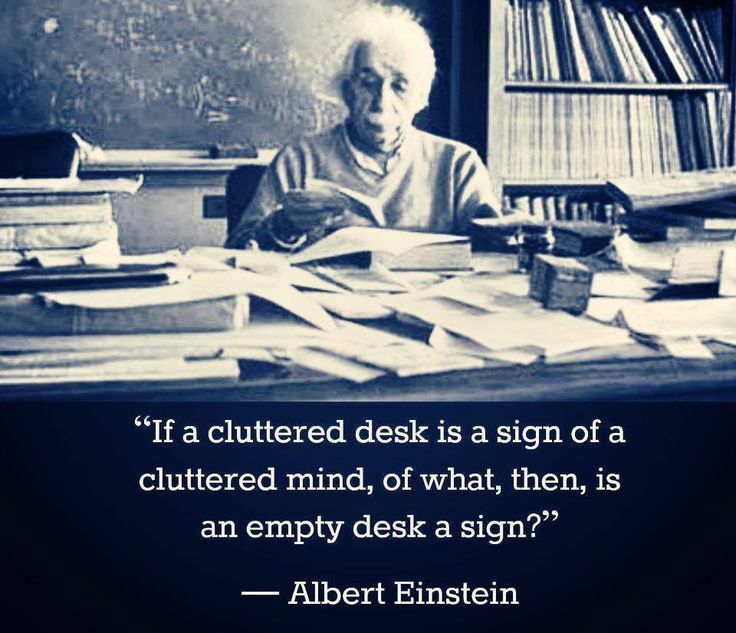 Then again, it’s your mess, and while the placement of your things may look completely random to others, to you, it feels very much in control. Creative people tend to think outside the desk. We all have friends who insist being disorganized is critical to innovation. Albert Einstein, Mark Twain, and Steve Jobs, all incredibly creative, led very messy lives. A few artists, such as Joan Rivers, felt nothing could be further from the truth. Love her or hate her comedic style, she entertained audiences for decades with jokes she spent a lifetime writing down and obsessively cataloging. For her, organization provided a framework for her creative energy. To me, organization is about being prepared for the moment when insight strikes. It’s about setting up my physical world to support me and creating conditions for creativity to flourish. The organization and management system in my studio may not look tidy to others, but it works for me. My studio is cluttered, but it is not dirty (Cluttered and dirty are very different!). I do not waste time clearing away my projects and tools each time I take a break from my work, but when I return I absolutely know where everything is located. I love that I can close the door to my garage studio when I come into the house because my home is a different story. While I do not mind the studio looking messy to others, I keep my home well-kept and orderly, partially out of consideration to those who share my home and partially because any small mess seems to take over the entire open concept first floor. When my house is cluttered, my mind is cluttered, leaving me feeling disorganized and out of sorts, and I find I have many more hours in my day when I am not distracted by a messy house. Who doesn’t need more hours in their day? How do you do your best work ? In what type of environment are you most creative? Would love to hear from you! 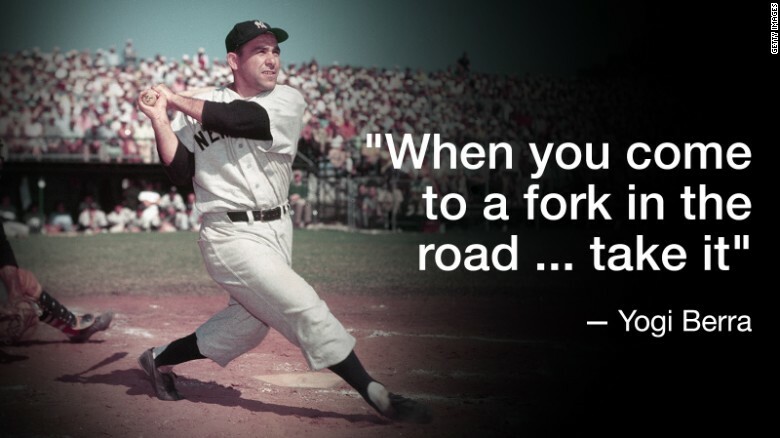 “When you come to a fork in the road, take it”, Yogi Berra once said when asked directions to his house. Turned out either path got you there. This quote, one of the many unintentionally witty pronouncements from Yogi, makes a lot of sense to me. Every fork is accompanied by choices to be made and questions about the outcome. Choosing one option over another doesn’t necessarily mean one is right and the other wrong; unfortunately life is usually not that simple. The best any of us can do is to make the best decision possible with the information available at the time. It’s all part of the journey getting to where we are supposed to be. If we realize later we made an “incorrect” decision, learning from our mistakes is a valuable tool which may lead to success later. Don’t waste time beating yourself up about past events which you have no control over. One of my favorite sayings is “Everything will be okay in the end…and if it’s not okay, it’s not the end” (source unkown). Easier said than done, right? Absolutely. I am actively working on appreciating the “wrong” decisions I make not only in life, but also with my artwork. The creative process is emotionally draining and each piece requires a significant time commitment. Every step of the way involves decisions that can potentially affect the outcome. Understanding that I learn as much from the failures as I do from the successes, and possibly more, is important. Sure, some of the failures are out of my control, but I have to admit that many are not. I spend less time these days obsessing about the “what if’s”, and as a result, find I have more energy and knowledge to grow as an artist. Back to Yogi…Yogi was an unlikely yet lovable hero whose nonsensical comments played a big role in his popularity both on and off the baseball field. His unintentionally witty pronouncements were well-known and oft repeated. Like so many others, I was saddened to hear of his recent passing.